There are numerous factors that can contribute to deciding whether or not a tree should be removed from a parcel of property or not, but a few are much more detrimental than others. It is important to speak with a licensed arborist if you believe a tree is posing a threat or otherwise hindering the use of your property so that a clear cut decision about how to move forward can be made, no pun intended. However, if you encounter any of the following issues, there is a good chance tree removal, or at least some serious pruning, will be necessary. A tree that is dying far from any structure may not be as big of a deal as one that could fall right on top of a house. Trees out of reach out any buildings still pose a threat if the area is regularly used by people though. A dying tree isn't the only reason a tree may need to be removed if it is in close proximity to a building. Excessive shade, tangling power lines, or roots that could cause foundation damage are all factors that need to be considered when considering tree removal. If you notice excessive branches falling from a tree, especially when windy, it is likely that the tree may be near the end of its life. A professional arborist will be able to give you a better idea regarding the condition of the tree, which can help you make a joint decision about what to do next. Trees that have become diseased often need to be removed. There are a few specific signs that a tree may have become ill. These symptoms include bare spots in branches where leaves should be, losing leaves early in the season, browning needles, falling limbs, bumps on the bark or fungus growth on the trunk or branches. A tree that is suddenly tilting to one side could very well be at risk of falling. It is best to quickly contact an arborist to have the situation properly addressed. If you are worried about a tree on your property reach out to a certified arborist. 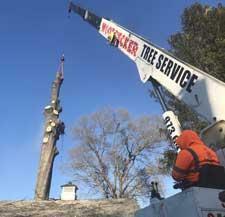 To inquire about tree removal in Wharton, NJ, or the surrounding areas reach out to Woodpecker Tree Service. We offer tree removal and other tree services that help keep you and your property safe. To learn more about our tree services in Wharton and the neighboring New Jersey communities give us a call at (973) 607-2549 today!